Magnificent coral reefs....myriads of tropical fish...crystal clear water...swim throughs...drop-offs...towering formations...there’s only one place to be this April or July, and that’s Cozumel for SportsCo’s Dive Adventures group vacations! Our host hotel will be Casa Del Mar. Featuring an open air restaurant, freshwater pool, swim-up pool bar, beach, and the friendliest staff on the island, the hotel overlooks the Caribbean. Conveniently near the hotel is Cozumel Marine World, our dive host. Two tank boat dives as well as some beach diving is included in the scuba package. 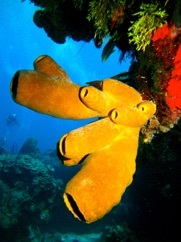 Cozumel has long been a favorite diving destination. Offering some of the most spectacular reef structures in the Caribbean, the island boasts an ever-changing underwater panorama. Fed by continuous currents, the reefs are home to schools of colorful fish, octopus, eels, rays, giant grouper, plus an occasional shark, eagle ray, and turtles aplenty! We’ll arrive on the island with time for an afternoon orientation dive. Enjoy an evening of fajitas, fun, and shopping in town. The next morning wake up to diving on Cozumel’s majestic coral formations. Afterwards grab a bite to eat and spend a lazy afternoon by the pool or explore the island. As for island adventure, Cozumel has plenty to offer! Great shopping with stores open until late, wonderful restaurants, sight-seeing opportunities, diving, snorkeling, and other water sports are all part of the island’s appeal. 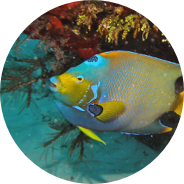 We invite you to join us for our April or July Dive Adventures to Cozumel! Tour price includes: roundtrip air from XNA, transfers to and from airport, 7 nights hotel accommodations, hotel taxes, tips, gratuities; five days of 2 tank boat diving, plus shore dives added to base price. Not included are divemaster tips and meals. This is a flex-fare priced trip which means final price is determined by current airfare. Air and hotel fees are due at time of booking. The dive package price is due 30 days before departure. To book a reservation, you need your name as it appears on your passport and date of birth. Your passport must be valid for 6 months after tour dates for entry to country. This trip is offered with flex-scheduling as well. Stay for the whole week, or a long weekend, it’s your choice! It’s a perfect opportunity for getting certified in warm, clear water!